Virginia. General Assembly. House of Delegates. Committee on Banks Report of the Committee on Banks, Relative to the Currency, &c. &c. &c. Doc. No. XIV. 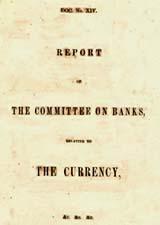 Report of the Committee on Banks, Relative to the Currency, &c. &c. &c. Doc. No. XIV. S. l.: s. n., 1863. Banks and banking -- Virginia.